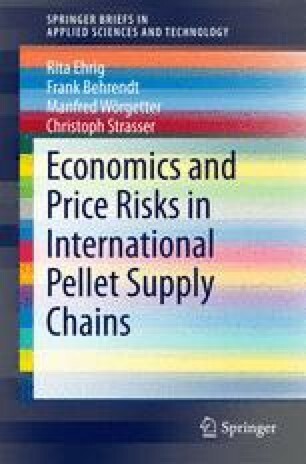 This chapter deals with the evaluation of most crucial supply risks, which exist under real market conditions in the biomass market. General risk parameters and relevant indices along the biomass supply chain are discussed in detail. A modelling of 10-year-price variations based on the three investigated supply chains is followed and current 3-year-price volatilities are presented. Raw material prices, shipping rates, exchange rates, and the final market price turn out to be the main drivers for actual price variations and investment decisions. They can have a major impact on supply chain economics and investment success. Finally, responding hedging strategies for biomass supply chains and related investment decisions are summarised.